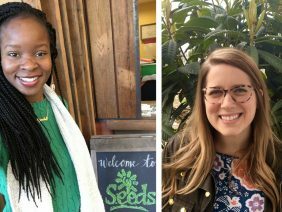 We’re thrilled to welcome Cynelsa and Abby to the SEEDS team! Cynelsa Broderick joins us after past experiences in sustainability and environmental education, administrative work, and the Conservation Trust for NC’s AmeriCorps Program. She has lived in Durham since Summer 2011, moving from Dover, Delaware after college. She earned an undergraduate degree in Environmental Engineering from the University of Delaware and is passionate about the creative and important connection between STEM and the arts. When not here at the educational garden and kitchen classroom, Cynelsa can be found outdoors enjoying nature or volunteering in the Durham arts community, lettering local calligraphy projects, or making visual art of her own. Abby Goodman joins SEEDS after several years of work in fundraising and communications in the Triangle, including UNC Chapel Hill and Benevolence Farm. She moved to Durham from Nashville where she graduated from Vanderbilt University with a degree in Human & Organizational Development. Abby believes in the power of building community through food and in her spare time can be found gardening, cooking, preserving, knitting and naturally dyeing yarn and textiles. And since it’s spring on our urban farm, we have a few more new faces at SEEDS! 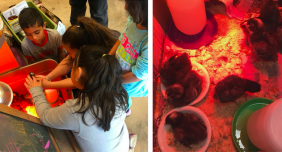 This time each year, the SEEDlings learn how to care for a new pack of baby chicks, who will live indoors until they’re a few months old and ready to join the older chickens in the Chicken Castle. 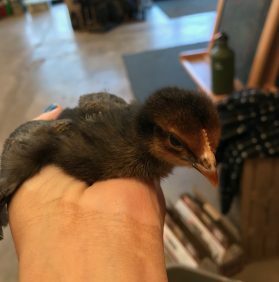 Stop by the front desk to peek in on these little hens-to-be. Hold one in your hand and hear them cheep! Urteile ber gerechtigkeit, existentielle schuld und strategien der schuldabwehr https://ghostwritinghilfe.com einfache gruppendynamische bungen in der sonderschule zum einben von und umgehen mit kommunikation universitt trier fachbereich i, psychologie.